Rep. Bob Goodlatte is reportedly tweaking his comprehensive immigration reform bill in a way that makes it more attractive to the several dairy-district GOP legislators who have signed the discharge petition. Goodlatte’s adjusted bill, first revealed by TheHill.com, would make the proposed H-2C agriculture worker program more useful to small-scale farmers and agriculture companies, including those in the districts of Rep. Chris Collins, Fred Upton, Jeff Denham, and David Valadao. Those GOP legislators face strong pressure in their districts for more farm labor — either via a ‘DACA’ amnesty or a Goodlatte-style guest-worker bill. The Goodlatte option may leave room for discharge-signers to drop their tacit support for the Democrats’ ‘dreamer’ amnesty and accept a Goodlatte compromise which is backed by GOP legislators in suburban districts. Goodlatte already made some minor tweaks earlier this year to appease the agricultural industry’s concerns over the guest worker program that is established by the legislation. But lawmakers from agricultural regions said the changes weren’t enough. Rep. Jeff Denham (R-Calif.), who represents the Golden State’s agriculture-heavy Central Valley and is leading the discharge petition push, said at the time that the cap on [H-2C] seasonal workers was still too low and the “touchback” provisions did not provide strong enough guarantees that workers will be able to come back to the U.S. once they return to their home countries. Goodlatte’s new proposal would make additional tweaks to the bill’s agriculture section, such as eliminating a requirement that guest workers prove they have a residence in a foreign country that they don’t intend on abandoning; ensuring that guest workers don’t need to wait for a visa while they touch back to their home countries; and providing 40,000 new [H-2C] visas for meat and poultry processors. Goodlatte is the chairman of the Hosue Judiciary Committee. Staff at his office declined to answer questions about the dairy industry from Breitbart News. “We continue to have discussions with Members and build support for the bill so that we have the votes needed to pass the Securing America’s Future Act in the House,” said a statement from his office. The bill is expected to get a floor vote in the third week of June. Goodlatte’s H-2C program would deliver roughly 1.2 million lower-wage guest workers to the nation’s farm industry, including the dairy industry, via three-year work visas. The overall number would even climb by 10 percent year, minimizing any need for the farming sector to invest in labor-saving machinery, such as robot cow-milkers. 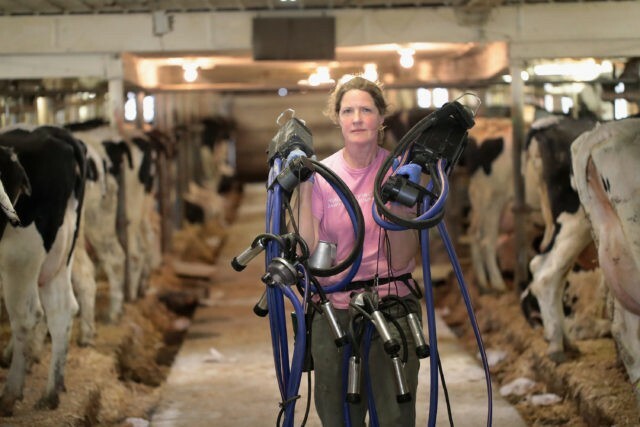 The robot cow-milkers are widely used in Europe but are produced in limited numbers in the United States. In 2017, farm-industry groups rejected Goodlatte’s H-2C proposal as inadequate, and have demanded more workers, at lower wages, with less paperwork. Goodlatte’s reported rewrite offers more workers and less paperwork, as sought by Denham, the most outspoken advocate for the discharge petition. The Goodlatte pitch to the agriculture GOP signers of the petition showcases the importance of cheap imported workers to the cash-strapped, low-tech food business, whose output surpluses have lowered prices even as new transport technology spurs growing competition from low-wage, high-tech foreign competitors. Rising wages in the United States — partly caused by President Donald Trump’s immigration-law enforcement policies — have further pressured the meatpackers, dairies, and fruit farmers, who have long relied on illegal migrants and imported refugees. The reliance on cheap foreign workers encouraged the industry to ignore the labor-saving machinery that is widely used in high-wage Europe. But with U.S. milk prices down by a third since 2014, the dairy industry now cannot buy the labor-saving machinery without some financial aid from Congress. But the chief problem with the H-2C program is that it is going nowhere, said Rosemary Jenks, policy director at NumbersUSA. Senate Democrats will block it even if it passes the House, she said. Last year, steady pressure on Midwest Democratic Senators might have allowed Trump to get the Goodlatte bill into law during 20127, she said. This year, GOP leaders in the House are not even pressuring GOP legislators to support the Goodlatte, bill, she said. Also, the discharge-petition contains a hidden gift to dairy farmers, she added. The discharge-petition is designed to provide political cover for House passage of the “Uniting and Securing America Act of 2017’’ which would allow at least 2 million young illegals to get on an eight-year track to a green card. The bill will provide few legal workers to farmers, but it will keep some of the illegal-immigrant parents of young illegals on farms while their children are in the long process, Jenks said. That long approval process is much better for farmers than a full amnesty, which would quickly allow the migrants and their children to move into nearby towns and cities for better-paid jobs, she said. Rep. Chris Collins (R-N.Y.) stands apart from the other signers in many ways: He occupies a safe Republican seat and was among Trump’s earliest supporters in Congress. But his western New York district is home to hundreds of dairy farms that rely on immigrant labor. “Right now, my dairy farmers are saying to Republicans: You’ve got the House, the Senate, the White House, and you’ve got to give us a legal workforce, and I agree with that,” he said. Eight GOP members from agriculture districts have signed the pending discharge petition, which threatens to allow Democrats to pass a no-strings amnesty through the House in late June. The other dairy-district signers include New York’s Reps. John Faso, Elise Stefanik and John Katko, and Pennsylvania’s Ryan Costello. That roster puts eight GOP dairy-sector legislators on the discharge petition. Another dairy-district Republican, New York’s Rep. Tom Reed, is signaling he will sign the discharge petition. Majority Leader Kevin McCarthy is also from a dairy district in California, and has very close ties to agriculture pressure groups, said Jenks. Retiring House Speaker Paul Ryan also represents a district with many dairy farms in southern Wisconsin. In 2014, Ryan pushed for the Gang of Eight” amnesty while arguing that the dairy industry needs a perpetual supply of cheap workers. Neither McCarthy or Ryan are opposing the discharge petition, Jenks noted. In fact, Ryan’s main Super Pac, the Congressional Leadership Fund, is aiding most of the discharge-signers. The CLF donors are not driven by concern over the fate of dairy farms but will gain if the discharge-amnesty wrecks Trump’s four-part immigration reforms, which are expected to raise Americans’ wages and slow the rising price of real-estate. Cheap migrant labor has also slowed the development of other labor-saving technology, such as the use of asparagus harvesters to replace hand-picking by migrant workers in cheap-labor California or higher-cost Michigan. While the agriculture industry pushes for the amnesty, GOP representatives in suburban districts worry that public opposition will hurt their reelection chances. Any amnesty will provide business with a wave of low-wage workers, so forcing down salaries for Americans and pushing down the workforce-participation rate. [Federal] Bureau of Labor Statistics data for the first quarter of 2018 shows that the labor force participation rate has not returned to pre-2007 recession levels, and relative to 2000 the rate looks even worse. Things are particularly bad for those without a college education. The problem is not confined to one area of the country; in virtually every state, labor force participation is lower in 2018 than in 2007 or 2000 among the less-educated. While the unemployment rate has improved significantly in recent years, the official unemployment rate includes only those who say they have looked for a job in the last four weeks. It does not include those of working age who have dropped out of the labor force entirely – neither working nor looking for work. So far, 20 GOP legislators have signed the discharge petition. If 25 GOP legislators sign the pending discharge petition, then 193 Democrats will join them to get the 218-vote House majority needed for a discharge petition to successfully schedule a floor vote, despite leadership opposition. The legislation in their petition will create a rare “Queen of the Hill” debate, in which legislators are allowed to vote for or against four rival amnesty-and-immigration bills. The bill which gets the most votes is the winner and is sent to the Senate.